A drunken Maine man gave the town of Howland a huge scare when he started up a chainsaw and allegedly began to threaten motorists. It happened last year, but somehow I never posted this piece, and it remained on the blog file as a draft. Well, I'd hate to waste it, so here it is for your reading pleasure. What kills me the most (with laugher!) is this quote from the article: "It's not a common occurrence for this sleepy little town," said resident Gary Bragdon. Ha!! It's good to clarify things like that. A man who waved a chain saw over his head, threatened motorists and did some impromptu pruning of local shrubbery was arrested at gunpoint. Lionel Dube Jr., 47, of Argyle, was charged with disorderly conduct, criminal threatening and violation of bail conditions after police responded to reports that he was waving the chain saw at passing motorists late Tuesday. 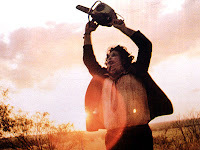 "You know how in the 'Texas Chainsaw Massacre' the guy raised his chain saw up and revved it? That's what he was doing," Deputy Sheriff Michael Knights said. "Alcohol was involved." Knights and Maine State Police Trooper Thomas Fiske said they disarmed Dube at gunpoint near the Howland-Enfield Federal Credit Union. By that time, Dube's chain saw didn't pose much of a threat because the chain had fallen off, they said. "It's not a common occurrence for this sleepy little town," said Gary Bragdon, the credit union's manager, who learned of the incident when he reported to work Wednesday morning. Bragdon, who lives near the building, said he'd heard the chain saw the night before. "You hear a chain saw at 11:30 at night and you think, no, it can't be. My mind must be playing tricks on me," Bragdon said. Dube, who has a lengthy criminal record consisting mostly of minor offenses, is due in Lincoln District Court Aug. 7. Imagine my surprise when I came across this wild story on the Creature Chronicles website. It's from 1997, and follows the escapades of a rogue ostrich or emu in Maine! BENTON, Maine (AP) -- It weighs 200 pounds, is more than 5 feet tall, has sharp claws, a long neck and can run 30 mph. And a state veterinarian says the big bird that remained at large Thursday should be considered dangerous. Mitchell said the big, flightless bird was last sighted Thursday in Winslow in central Maine. Rodney Blaisdell of Benton received a gash in the hand when he tried to catch it barehanded. Fourteen stitches were required to close the wound after his encounter Tuesday. "I grabbed that bird around the neck and he just started putting the feet to me,'' said Blaisdell, adding that he bled so much from the wound that he almost passed out. Several people have reported seeing the mystery bird, and some have gotten close to it during the past few days, officials said. On Monday, two boys who roped the bird found out it wasn't going to be captured without a fight. "He didn't enjoy the rope, but when he hit the electric fence he went berserk,'' said Christine Bessey, dog catcher for the Benton?Albion area. "I'm tired of chasing that thing. We'll find the owner, and when we do, the owner can chase him,'' said Bessey. According to Blaisdell, the bird apparently got loose Sunday as it was being transported in the back of the pickup truck of a Brooks man who had bought the bird from someone in Clinton. Chip Ridky, a state veterinarian, said that the last time an emu got loose he had to fire four or five tranquilizer darts at it, and finally had to pounce on it to bring it down. Mitchell said she knows of some central Maine residents who own ostriches and emus, but she believes the loose bird is an emu. Digging a little further, I found some historic Maine ostrich dealing way back in 1883! NEW ORLEANS, Dec. 10. -- The Austrian bark Josip, Giurieevich master, arrived yesterday from Cape Town, South Africa. 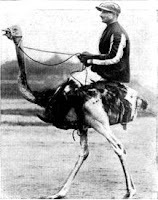 She left Cape Town Oct. 15, and as part of her freight had 23 ostriches, all of which reached here alive, with Mr. E. J. Johnson, of Maine, Agent of the American Ostrich Company, a corporation organized under the laws of Maine. Mr. Johnson said he had gone to South Africa about a year ago for the purpose of purchasing ostriches for the company. He traveled into the interior 400 miles from Cape Town, in the Boer country, where the ostrich farms exist. Fine birds cost from 250 pounds to 300 pounds per pair. As many as 50 feathers a year are to be obtained from each bird, and as the plumes sell from $5 to $12 apiece in this country, there is considerable profit in the business. By importing the birds, the duty of 20 per cent. 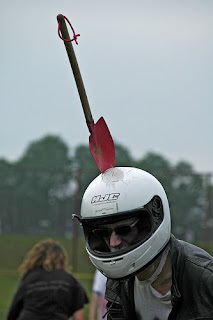 on the feathers is avoided. The problem to be solved is to rear the young birds in this country, and the experiment is being tried in California. The American Ostrich Company have a farm at San Diego, Cal., and thence the birds in Mr. Johnson's care will shortly be taken. On page 147 of Kate Field's Visit to San Diego by the San Diego Historical Society, viewable as a PDF here, there is an 1888 photograph of a man with several healthy looking ostrich specimens, perhaps some of the same that came to the U.S. on the Josip five years previous. At the same time  the American Ostrich Company was organized in Maine with E. J. Johnson as manager. He went to Africa and spent there a year, studying the habits and management of the birds. He started with twenty-three of them and landed at New Orleans in December, 1884, after a voyage of fifty-three days, with all the birds alive, a remarkable result, as the usual loss at sea is about 25 per cent. ditions for the establishment of an ostrich farm. The birds took kindly to their adopted home, and have thriven well, the old ones maintaining their natural vigor, and the American-born being at two years unusually fine, both in size and quality of feathers. There are fish stories, and then there are fish stories to end all fish stories. It sounds like a morning where you're glad you got a chance to drink your coffee before all the excitement started. HALLOWELL -- Bob Greene saved a man's life with his fishing pole early Thursday morning. Greene, 42, said he was drinking a cup of coffee and waiting for the sun to rise over the Kennebec River around 4:30 a.m. when he heard what he thought was a bird making noise in the distance. He figures about 20 minutes passed. Then he saw what he first thought was a log. A second later, he realized it was a man bobbing down the river, and heard a faint call of "help." Michael Gibbs, 25, of Augusta told police he jumped into the river from the Cushnoc Crossing bridge in Augusta -- a 114-foot high span commonly known as the third bridge. Greene said his first instinct was to jump in -- he took his wallet out of his pocket just in case -- but a 911 dispatcher told him to throw something in to try to save Gibbs instead. He set down his cell phone so he could cast his 7-foot spinning rod and Okuma reel with 25-pound line. It landed about 2 feet beyond Gibbs, who Greene estimated was about 35 yards from shore. The Chug Bug lure -- a 4-inch long lure with three small hooks on the end -- snagged Gibbs' shirt near his shoulder. "It was a struggle to get him out of the current so I could reel him in," Greene said. An experienced fisherman who makes fishing rods for a living, Greene said he knew he had to be careful not to snap the line. "He had a pretty good hook on him and was slowly reeling him in when the officer arrived," [Hallowell Police Chief Eric] Nason said. Okay, how weird is this? There is a town in Wisconsin called Maine. But wait-- actually there are two towns called Maine in Wisconsin. Not only that, but the Wisconsonites have a blueberry festival. No, I'm not kidding. This year, Jeff Utech, who runs the festival at Utech's Rainbow Farm, finished work on a catapult, "which will fling a large fake blueberry into a field that will be marked with spaces. Folks will get a chance to win a blueberry pie with that game." Wow. How come no one in Maine has a giant fake blueberry flinging catapault?!!! Plus there are lots of goats and a pair of yodeling twins. I found all this out because the event, although happening in Merrill, which is about 80 miles from the town of Maine as the crow flies, was entered as an article and somehow associated with the town of Maine in its byline. Go figure. I do enjoy serendipity in blogging. TOWN OF MAINE -- The humble blueberry will be celebrated with music, games and, of course, pie and other food on Saturday. The third annual Blueberry Blitz will be held from 10 a.m. to 7 p.m. on Utech's Rainbow Farm, 3880 Rainbow Drive. Farm owner Jeff Utech and his family plant about eight acres of blueberries each year. They decided to hold the Blueberry Blitz as a way of sharing their farm. "We like to educate people so they can really see what the farm is about," Utech said. The farm is unusual. Utech sells goat milk, and there are about 500 goats on the farm. Although the blueberries get top billing, the goats are featured too, Utech said. "Kids can milk goats with their own hands," he said. People also will get the opportunity to lead a goat or a llama on a pasture walk, buy arts and crafts and participate in goat cart races. Live music will be on tap throughout the day. Doubletake, the yodeling twins Ryan and Brad Hildebrand of Merrill, will perform at 11 a.m. The Magees of Wausau, a band that mixes traditional Irish tunes with rock music, will play from noon to 2 p.m. and Vinny Bex Dae, an alternative rock duo, will take the stage from 5 p.m. to 7 p.m.
Last week, Utech was finishing work on a catapult, which will fling a large fake blueberry into a field that will be marked with spaces. Folks will get a chance to win a blueberry pie with that game. Blueberry Blitz costs $5 for adults, $3 for children ages 6 through12 and free for ages 5 and younger. Directions to Utech's Rainbow Farm: Take Highway K nine miles north of Wausau, then turn east onto Rainbow Drive. It's the first farm on the left. Signs will point to a parking area, and attendees can catch a hay ride shuttle to the farm and back again. For more information, call 536-7271. Sunday morning in Pittsfield Maine July 20, 2008 there was a full moon and the sky was clear. Me and my 2 daughters were sitting outside at 1:16am talking and we looked up at the moon and we saw a very bright light that was moving very fast and then just disappeared (this was not a shooting star). As we continued to look up at the sky we saw more unexplainable bright lights one after another they happened within 10-15 minutes of each other. The bright lights would just appear for about 5 seconds then split in half then disappear there was no reasonable explanation for what had happened we had never seen anything like it before. The last one that me and my 2 daughters saw was around 3am and it flew right over us from North West to South East over the house and past the trees then we could not see it anymore. This time the light didn't disappear after 5 seconds it just continued to fly across the sky very fast. My daughter noticed that the object had 3 points that lit up like a triangle. You could not hear a sound/noise coming from the object it was very quiet. Over the 2 hour span of time we saw about 7-8 bright bright lights that would appear out of no where flying very fast in the sky then split in half after 5 seconds then disappear. Both my daughters went back inside to go to bed and I was out side drinking a coffee and smoking a cigarette and around 4am it was starting to get light out there was no stars in the sky and I was outside alone loading my boat on to my truck to go fishing with my son and I saw another bright light in the sky then it split in half then disappeared. Did you see what I saw(ed)? 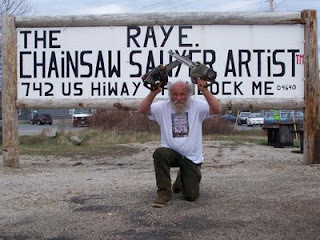 A very interesting article on chainsaw art from the New York Times, which features Maine resident Ray Murphy, who asserts his role as inventor of chain-saw art in 1953. Photo from chainsawentertainer.com. HANCOCK, Me. — Ray Murphy’s art is dirty, dangerous and very, very loud. Using only a chain saw, Mr. Murphy creates animals and figures from huge tree trunks and meticulously carves numbers on toothpicks and Popsicle sticks. When he is finished, so is the piece — he refuses to sand, varnish or paint anything he makes. And for $10, anyone can see him make that art. Mr. Murphy started a nightly chain-saw show last year, a 90-minute performance where he attacks pieces of wood with one of three chain saws. At each show he recruits a volunteer from the audience and makes him wear a belt with a wooden buckle, from which he carves something. So far everything has turned out fine. “It’s so unique that people don’t quite get it,” Mr. Murphy said. Jen Ruth, who books dozens of chain-saw artists at carving competitions across the country, said there were about 8,000 carvers nationwide. “As an agent, I’ve seen a massive explosion in chain-saw art,” Ms. Ruth said. “A lot of people want to get into it because they think it’s cool and they’ll get rich real quick, which is not true.” Most artists make their creations year-round and perform at competitions and fairs in the summer. But no one is doing the same thing as Mr. Murphy, Ms. Ruth said. Mr. Murphy claims that he invented chain-saw art in 1953, when as an 11-year-old in a Wyoming logging family, he started carving animals from logs. He kept carving through his teenage years, in college, during stints at various logging companies and in the Forest Service, and ultimately at his own logging business. Mr. Murphy went on to fame, appearing on “Wide World of Sports” on ABC in 1982 and carving the alphabet into pencils at the Ripley’s Believe It or Not museum in Myrtle Beach, S.C. The museum still displays many of them, its archivist, Edward Meyer, said. Business in Maine went well — so well, he said, that people bought his creations faster than he could make them. He socked away the money he made to fulfill his dream of performing with a chain saw every night. He moved his shop from a side street to busy Route 1, and spent $250,000 building a theater for his shows. Rows of bleacher seating look onto Mr. Murphy’s plexiglass-covered stage. “This is my dream,” Mr. Murphy said outside the bus, which now holds newspaper clippings, awards and other memorabilia from his carving career. As 7 p.m. — show time — approached, Mr. Murphy got antsy. “Anyone here yet?” he asked. Mr. Murphy got into the booth and started carving. Soon, a large log became a table and chairs, with a hamburger and fries atop the table. Then he meticulously tackled a piece of wood using a smaller chain saw, his face close. Out popped a small ladybug, which Mr. Murphy brought out and put on a dime. The Bar Harbor Insider did a great piece on him, which includes photos and links to an NPR interview with him. His show and gallery are located at 734 U.S.Highway 1, Hancock, ME, which is 5 miles East of Ellsworth on U.S.Highway 1. 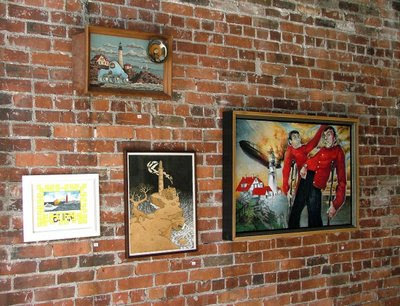 There's another good article, this one by Nick Gosling, from 2006 when he opened his show. Click here to read it (with photos). LEWISTON, Maine (AP) — A Wilton man is having trouble sleeping since he found a python snake about 9 feet long under the engine of his pickup truck. Harley Burgess’s shocking discovery Saturday is the second of its kind in less than a week in Maine. Last Wednesday, a Gorham woman found a snake — also identified as a reticulated python — in the washing machine. In Wilton, Burgess says he’s still shaking when he thinks of the python found under his truck. 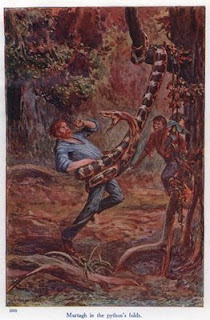 He’s had nightmares about the snake getting his grandson, who was with him the day the python was discovered. Burgess has been searching for clues as to how the snake got loose in his truck. Reticulated pythons are illegal in Maine without a permit. 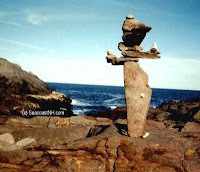 There's a well-observed post about the inhabitants of Monhegan Island, both stone and human, by As I Please author J. Dennis Robinson, over at SeacoastNH.com. Click here to read. There is a nice selection of photos, too (right). A few of the rock formations, like clouds, have recognizable shapes. There are animals, dancers, houses and birds. But most of the stones defy description. They are the essence of balance, weight and weightlessness, shapely and shapeless. They are wild natural things made momentarily more beautiful by hand. They are intrusions on the landscape and they are the landscape. For fans of New Hampshire history, Robinson's articles are a treasure trove of material. Maine afficionados may enjoy his account of the Haddock Brothers, rumored to be the original European settlers of Maine. The Traveling Midwife blogs about an eyebrow-raising sign she spotted at the Canadian border crossing at Calais, Maine. Yow! Read hre post here. 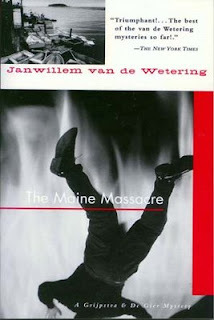 Those of you who have discovered the work of detective fiction master Janwillem van de Vetering through his books about Dutch policemen Grijpstra and de Gier will be sad to know that he succumbed to complications due to cancer at the age of 77 on July 4th. That same police team that charmed so many of us won him the French Grand Prix de Littérature Policiere for their antics in The Maine Massacre, which landed them out of their Amsterdam element, here in the Pine Tree State. 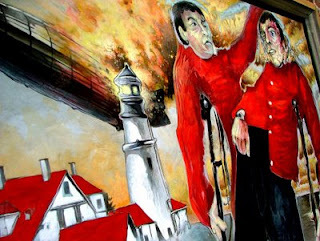 Back in 2003, the Portland Phoenix printed an article by Christopher Thompson about the author and his relationship to the state of Maine, please click here to read. It's well worth the look -- it contains a look at van de Wetering's daily environment here in Maine, and tales of his battle with cancer, and, during the throes of WWII, with an attempt at suicide stopped by a surprising savior: "I was still going to kill myself," he explained, "but I had to figure out this Hieronymus Bosch business first." He set another of his books in Maine, Murder By Remote Control, which appeared in graphic novel form with illustrations by Paul Kirchner. The very interesting NY Times review of it appears here. There's a great article in the Bangor Daily News about the storm, including photos of the hail. Check it out! Remarkable eyewitness accounts abound, including flying pigs! A "Wizard of Oz"-type storm Saturday produced a "wall of hail" so heavy it pounded pumpkins into mush and a wind so fierce it lifted a dog and two pigs into the air and peeled off a roof on Happy Corner Road, residents said Sunday. No one was injured. The storm, which brought hail, thunder, lightning and very high winds, emerged from Baxter State Park, according to residents of the road who live about a mile south of downtown Patten. Happy Corner Road is at the north end of Baxter State Park. The storm went around Mount Katahdin to the north and came through the woods in basically a straight line, resident Sean Kelley recalled Sunday. 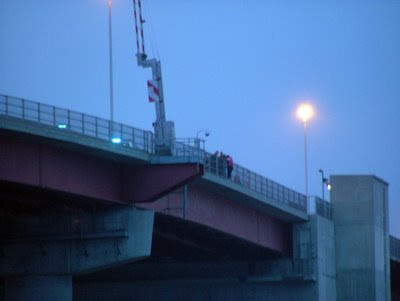 Last night we covered some police activity that occurred at the bottom of State Street and on the Casco Bay Bridge. This morning, we are no more informed than we were when we took our photos, with the exception of a note from a neighbor across the street from the activity, who wrote to us, "...Last Sunday my husband and I noticed there were two police cars out in front of the brick building on the corner of State St. and it looked like a domestic violence call to us. Now yesterday all that drama went down in the same building and the coroner's van was the last to leave the scene. I think something pretty sad must have happened." None of the main news channels have picked up on the events, and neither has the Portland Press Herald. The only news outlet that has reported on it is the West End News. To see the original post from last night, please click here. A slew of siren-laden vehicles rushed past our apartment this evening, just after 8:00pm. When they didn't let up, and fire trucks joined the police cars in the parade, we thought we'd see what was up. We encountered the logjam of emergency vehicles at the intersection of Danforth and State Streets here in Portland, where they had the street blocked off down to where State and York Streets join at the base of the hill. Some of the fire trucks were departing, but several police and EMT vehicles remained on the lower part of the street. A few Portland Police Department cars suddenly appeared, heading across the Casco Bay Bridge, and we drove across in their wake. Just past the control booth at the halfway point on the bridge, we saw a woman in a hot pink jogging suit jacket on the opposite side of the walkway than one expects to see people. She was hanging onto the wall with one arm as we drove past, and officers were approaching her on foot from their cars. (Let us also mention the High Weirdness of seeing a dark SUV pulled over on the southbound side of the bridge with the vanity plate "FNORD"!) On reaching the South Portland side of the bridge, we drove out through the marina to see if we could spot what was going on out over the water. We were just in time to catch these shots, as officers, after joining her on the water side of the walkway wall, apparently convinced her to return to the land of the living. In this sequence of shots, you can identify the unknown person by her bright pink jacket, as she climbs back over the wall. Please click on the photo for a larger image. Since none of the news channels is on top of this story, we have no idea what happened. Conjecture is almost useless, but we wonder if someone who was involved with whatever happened on State Street ran from the scene in an effort to either escape, do away with themselves, or distract attention from the original scene. The coincidence of these two incidents occurring within clear walking distance from each other and almost simultaneously implies a connection. But what do we know? Just what we glimpse. The other week local Press Herald blogger extraordinaire Justin Ellis went on a brief hiatus to further his skills in the high-tech communications realm. Why am I telling you this? Because it was a great opportunity for him to launch some guest posters on his blog, and one of the ones invited to flex their Portland-based cultural writing muscles was me. 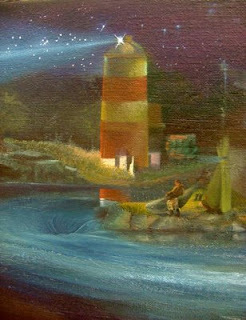 It was a great excuse to talk about the non-traditional lighthouse art show that's showing at Sanctuary until the end of July. You can read the full post here. However, the photos I took for the story didn't make it onto Justin's blog, so for those of you many miles away, I thought I'd share them here, as this is one of those art shows that only comes 'round once. So here is a taste of what awaits you! You can click on the images here to see larger versions. 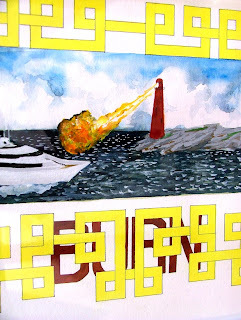 Untitled by Loren Leahy (detail) brings the "Kaboom!" home. Not your average postcard image of a restful lighthouse scene. Well, the weather in Maine is known to be strange at times, but this week it's gotten downright out of control. Wil of the "Where There's Wil, There's Always a Way" blog posts about the aftermath of what everyone seems to think was a tornado that swept through Gorham in the midst of Friday's torrential thunderstorms. This isn't the first time Gorham has been subject to tornadoes. Back on October 18, 1855, a Mr. Niles was featured on page 2 of the New York Times in an article about the twister that moved his house for him. Thus far it saved Mr. Niles a good deal of trouble and expense, for he intended to move his house back to the very spot where the tornado left it. But he was not quite so well pleased with the freaks the wind played with his barn: it took it completely apart and carried the timbers, boards, &c. up a hill some two hundred feet and left them there! [...] Mr. Niles and his family were in the house at the time of its sudden and unexpected removal! In sadder news, there were two fatalities from the storm due to lightning strikes in nearby Standish. Read the full story on the Portland Press Herald's site, which has a bunch of dramatic photos as well. Some of the sadness of these deaths is in their seemingly innocent cause. As reported by the Press Herald, "The man and woman were struck by lightning when they went outside to retrieve a pair of eyeglasses that had been taken by the family dog, according to the sheriff's department." The night of Saturday, July 12th, was a wretched one for many Parkside residents in Portland. 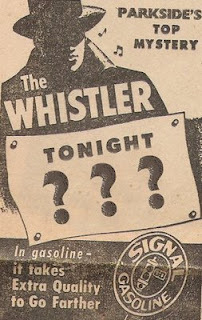 Beyond the unbearably sweltering weather, a singular annoyance was added -- the Whistler. It was too hot to comfortably close windows, and the whistling was too piercing to ignore. Last night the neighborhood waited uncomfortably, comparing notes from house to house, neighbor to neighbor, about suspicious neighborhood activity. But the Whistler stayed away. BUT NOT TONIGHT!!! Oh no, ladies and gentlemen, tonight she was back in full swing, and forewarned, everyone paid more attention this time. It was quickly discovered by observation that there were two whistlers, apparently signaling back and forth to each other, a blonde (see photo) and a woman with darker hair, who was often in the company of a somewhat short Hispanic male. Initial efforts managed to alert the police to their presence, and the blonde was stopped and questioned by the police at the corner of Mellen Street and Sherman Street. Unfortunately, due to the fact that they could not prove any wrongdoing (I'm not sure why disturbing the peace doesn't qualify), they had to let her go with a warning. Officers David Mulry and Brad Rogers encouraged neighbors to continue to call in to the Portland Police Department's dispatch number to alert the force to the whereabouts of the miscreants. That number, for those of you who would like to join in assisting, is 874-8575. The apparent activity (in case you think it's just about the whistling -- it's not!) is, as near as we in the neighborhood can figure, a signalling system for prostitution and drug-based relay transactions. Tonight after she had departed from the police's company, stayed quiet again for a while, and then returned to her ear-piercing activity about an hour later. An enterprising neighbor took the opportunity to take her photo (see right, click on photo to view larger version). So if you see her around -- BEWARE, and feel free to call the police if she is making her rounds. Parkside residents were awakened at 5AM on Saturday morning, August 2nd by the Parkside Whistler, who has plagued the neighborhood for three week. Residents first reported that an unidentified woman roamed the area of State Street between Grant and Sherman on the night of July 12th, keeping residents awake with her whistling. And two nights later, the woman was reportedly joined by another woman and possibly others. Residents of the Parkside neighborhood are considering the reinstitution of the Parkside Crime Watch to deal with what they say is an upsurge in prostitution and drug-related activity in the neighborhood. Police have been doubling up patrol in Parkside according to Parkside Neighborhood Association President Diane Edwards. Prostitution stings have been carried out and drug-related evictions have occurred in two houses, according to Edwards. The men’s ages ranged from 22 to 75, and all were from the Portland area. arrests were made between the hours of 11:30 AM and 3:30 PM. “Business was brisk,” said Preis. The issue will be a topic of discussion at the next Parkside Neighborhood Association meeting on August 14th. THE TIME IS NIGH! Man-Witch Art NOW! The time is nigh! Even now, the brave and stalwart allies of the Man-Witch gather their artistic might and rally their brushes and pens for a mighty onslaught of art, the likes of which Portland has never seen. Those who wish to join their ranks are invited to submit their offerings of art inspired by the band Man-Witch NOW! The submission period closes July 25th. Pieces may be dropped off at Geno's Rock Club (http://www.myspace.com/genosrockclub, 625 Congress Street, Portland, Maine), where entry forms can also be found. Please forward this information to anyone who may be interested, with our gratitude. All of the glorious art treasures that result will be on display during the First Friday Artwalk here in Portland, and thereafter for the month of August! 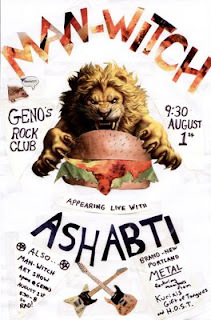 WHAT: First Friday Artwalk, opening of the Man-Witch Art Show, followed by a live performance by Man-Witch and guests Ashabti (brand new Portland metal, featuring members of Gift of Tongues, Kurixis, and H.O.S.T.). During the show, the creators of the most mind-blowing pieces of Man-Witch will receive special awards (those not present for the proceedings will be contacted later). Artists have been invited to execute artwork inspired by Man-Witch's members, their stage set, and their songs. Draw the Death Truck! Draw the Flaming Pillow of Fear! Draw the Necro-Atomic-Abominomicon! Heck, draw the Super Ultra Mega Terrifyafearinator... if you dare! Art must be ready to hang! Sorry, no freestanding sculpture (the lobby is a little too trafficked and hazardous for freestanding art to survive long). Wall-mounted sculpture is fine. Use any media you like -- photos! comic strips! collage! paint! ink! ...and other things too numerous to be mentioned without causing insanity!!! Sponsored by the Art Horde! Last night, starting as early as about 8:00pm, a woman wandered up and down State Street around the Sherman Street and Grant Street block, and further, whistling a piercing note, much to the annoyance of the neighborhood. Every now and then residents wouldn't hear her for a while, and all hoped that she had finally quit her racket. However, each time, this was not the case. In a method not unlike Chinese Water Torture, this shrill and un-ignorable presence reared its noisy head hour by hour, sometimes more often, and found locals calling the police for assistance repeatedly, to no avail. As late (or rather early) as 3:00 in the morning, if you can believe it, this was continuing, at which point Portland Police Dispatch replied to this caller that, "Things seem to be quieting down in the rest of downtown -- they have been extremely busy tonight. They should be able to finally get someone over there shortly. We'll see what we can do." After 3:00am the woman seemed to give up (either that or the police finally caught up with her, or I finally passed out from sheer exhaustion), a full 7 hours after she started her spree. We'll see if she shows up again tonight. IF SHE DOES come back, and you would rather get some sleep: Please call in a noise complaint to the Portland Police Department. Their non-emergency number is (207)874-8479. I'm pretty sure she's violating the local noise decibel limit ordinance, not to mention the basic right to an environment where one should at least get some sleep in the middle of the night, i.e., she is most definitely disturbing the peace. All I know is, folks around these parts want to get some sleep tonight, and if they don't, things may get pretty nasty in the ol' Parkside neighborhood. 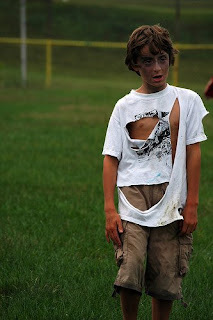 Sorry you missed Zombie Kickball? Or perhaps in the mood for a more sedate gambol with the dead? Then try one of the many regular tours offered up by Spirits Alive! You can also scroll down further if you are more practical-minded, and peruse the list of workdays when volunteers and those who enjoy the earthy delights of gardening add their touch to the Eastern Cemetery by hand. In 1632, settlers began arriving at the place we now call Portland. No buildings remain from that time. The open land of Eastern Cemetery is an appropriate site to learn about some of the events of the 17th and early 18th centuries that occurred within sight of the cemetery and shaped Portland’s indomitable spirit. A fascinating introduction to the geology of the Eastern Cemetery, including markers and monuments; a brief introduction to early mortuary art (as seen on the stones), and the effects of the environment on the site. Stroll through three and a half centuries of the Eastern Cemetery’s intertwined past with the Portland peninsula in this local history-laden tour. All tours begin at the Congress Street gates of the Eastern Cemetery, and will be cancelled if weather is very rainy. The Eastern Cemetery is located on Congress, Mountfort and Federal Streets at the foot of Munjoy Hill. Tours take approximately one hour. The ground is uneven at this National Trust for Historic Places site, so please wear appropriate footwear. Tickets are $7.00 for adults and $4.00 for seniors (62+, children under 12 and students). Cash or check. Join us at the cemetery when we spend the occasional Saturday morning trimming, pruning, cleaning and tidying the landscape. The City of Portland generously supplies us with tools, mulch, water and wheelbarrows, and we train volunteers on how to perform gardening tasks while carefully working around the historic stones. We have a good time and sometimes even break a sweat! Spice up your summer with a little planting/watering/mulching in the cemetery! All are welcomed, green thumb or not. Wear sensible shoes, bring work gloves, a bottle of water and sunscreen or a hat. Bring tools if you have them – a rake, shovel, pruning shears, and wheelbarrow are very useful. We also take loan of City tools so those will be available. Not up to planting trees? We have light pruning and trimming to do as well, and though volunteers have already done a trash pick-up, there's more to do. Mark your calendar with these remaining workdays: August 9, and September 13. Spirits Alive is a non-profit organization that supports public access to, events and education, and a master conservation plan for Portland’s Historic Eastern Cemetery. Group photo by Cat Krupsky. 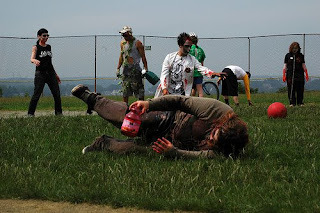 Well, it's been about a week since the brain-loving brouhaha that is Zombie Kickball happened. Enough time for more reports to trickle in, for people to collect their various body parts and figure out what happened on that crazy afternoon. Lucky for us, there were plenty of folks, zombie and non-zomb, to document the occasion and help us figure out what the heck happened. Photo of zombie Polaroidist by Michelle Souliere. Matt Cargile and Katie Maloney of South Portland made up the ultimate odd couple. Though the two were dating, Maloney was zombified, while Cargile, carrying a special lobotomizing tool, played a zombie hunter who was the last member of his elite Special Forces unit. "We sleep in separate beds," Cargile said. "He has to keep his door locked, or I will kill him," added Maloney. "Who knows what our children will be." You can read the full Sun Journal article here. Photo of Matt Cargile, Zombie Hunter, (see right) by Michelle Souliere. 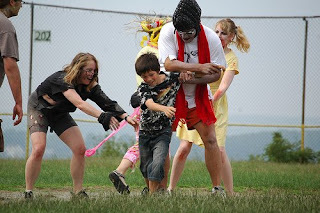 If you missed out on the zombie kickball game last weekend on the Eastern Prom in Portland, you can view some of the shenanigans and zombie action in this hilarious film by Portland's beloved Monkey. If only Monkey had realized that even monkey brains aren't safe when zombies run wild. 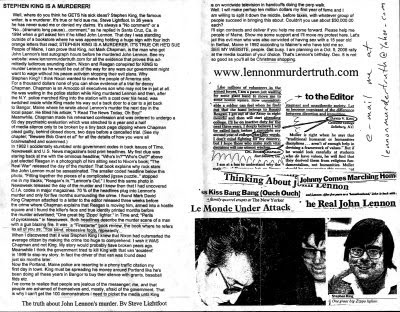 It has come to our attention that someone is propagating the conspiracy theory known as the "Stephen King Killed John Lennon!" theory. Yes. Again. As the antagonist Steve Lightfoot says himself, he's been hassling King about this for 26 years. I was at the library in Portland last week, and one of my friends handed me a new and updated version of the handout shown in our old post about this vintage conspiracy theory. She had been given the sheet (see below) by a fellow who had a fresh box of copies from Kinko's in his hand for distribution. In further discussion with other friends, it was also discovered that this conspiracy theory was also mentioned on Coast to Coast radio within the last month or so, apparently giving it a fresh jolt of life. Now sporting an updated rant, and a website to sell his 24-page booklet, Steve Lightfoot has moved into the technological age, although maintaining ties with his photocopied past. I was kind of loathe to scan and post the new version of the handout here, but I'm sure you intelligent folk will be looking at it more as a piece of curiosity than as a piece of evidence. As when he was in Bangor, Lightfoot has quickly accused the local police of being in on the conspiracy. Part of the new text of the handout includes the following: "Now, the Portland, Maine police are resorting to a phony traffic citation my first day in town. King must be spreading his money around Portland like he's been doing all these years in Bangor to buy their silence with grants, baseball filds etc." Lightfoot is aiming for a demonstration to occur at an undetermined location on October 9, 2008, on John Lennon's birthday. I only WISH King'd been spreading his money around Portland -- if he had been, our library might not be in such poor financial straits right now (and kudos to the Bangor Public Library for being the regular beneficiary of his book-loving grace). Call for help: Endangered Cryptozoology Museum! The long and the short of it? According to Coleman, "Realistically, for the museum to continue alone, I have set a goal of $15,000 to raise for the museum in the next three months, to keep the International Cryptozoology Museum alive and deal with finding and moving into new space. I need to find a location that is affordable, which gets good people traffic. 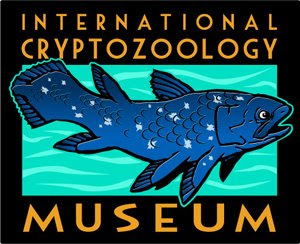 In the future, in a new location, the museum will charge a bit and be set up to sell many kinds of cryptozoology books (beyond my own) and cz objects." He goes on to say: "If you wish to contribute now, a little bit or a lot, I thank you. You can use my email (lcoleman@maine.rr.com) to send me money via PayPal. Or you may directly send a check made out to:"
For those of us who have been lucky to spend a little time amidst the cryptozoological and cultural wonders of the Museum's collection, it is easy to vouch for it and to say that it is something that everyone should be able to see for the price of admission. Loren is a hard worker, who has traveled many miles and many years in quest of the mysteries that fascinate so many of us sitting in our armchairs (so to speak). This is a tremendous opportunity to step forward and give his work the little push it needs to wind up on top for years to come. Hear, hear!! !